Finally after about a month of searching, I've had locally grown brussel sprouts (on the stalk no less) brought into the co-op. I found them by asking around- "who has brussel spouts? 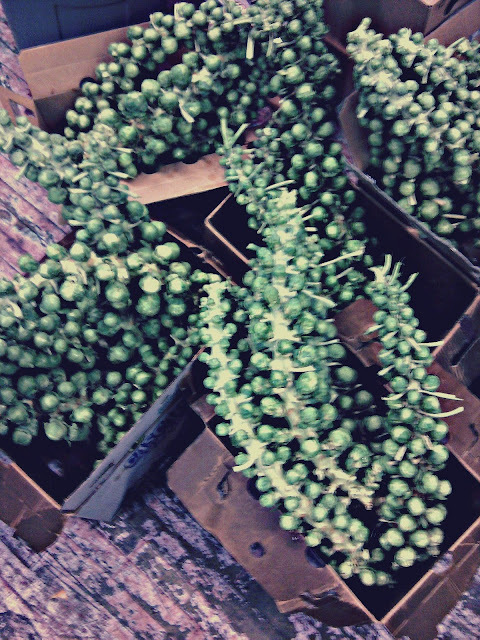 who has brussel sprouts? ", whenever I'd be ordering from a farmer or talking to my PR gal (who knows some farmers as well). I could have just taken the easy way out and ordered California-grown brussel sprouts, but I wanted to bring in something really special and local for the upcoming holidays. 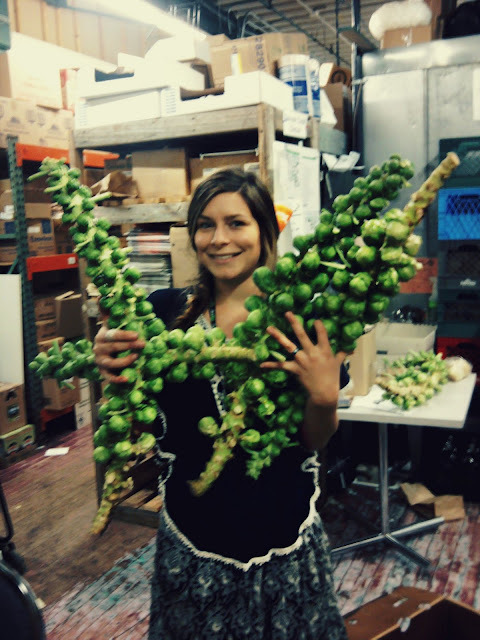 These brussel sprout trees come from Snowgoose Produce of Fir Island, Washington, up near Mt. Vernon and down the road from Frog's Song Farm. I had heard that they had them, so when I was working in the back one day and Erica came in to deliver their gorgeous rainbow colored eggs (white, blue, brown and green eggs), I immediately asked her about the brussel sprouts. Yup, they had them! And yesterday they came with 28 stalks for the co-op along with their egg delivery. I wish I had a better photo of them...lately I've been having to take all of my photos on my cellphone. Anyway, it was quite the procession when we were bringing the stalks to the back. We carried box after box of these science fiction-looking tentacles loaded in sprouts. I kept jokingly saying, "be still my beating heart", as I was setting them out...I was so excited! To make the evening even better, Frog's Song Farm came in shortly after with a full delivery of arugula and ruby streaks mizuna bunches, fat green cabbage heads, bright lights swiss chard, fennel bulbs and beet bunches....this was as I was setting out more bok choi bunches from Five Acre Farm. Aww! Bringing in local!